27 November 2017 – Developing countries are to receive US$540 million under the Montreal Protocol to continue their work in phasing out ozone-depleting hydrochlorofluorocarbons (HCFCs) and to initiate enabling activities for the phase-down of climate-warming hydrofluorocarbons (HFCs) under the Kigali Amendment. The funds will be provided by developed countries over the period 2018 to 2020 through the Multilateral Fund for the Implementation of the Montreal Protocol, which has disbursed over US$3.7 billion since 1991 to support developing countries to phase out chemicals that destroy the ozone layer. Montreal Protocol parties made the funding commitment during the joint 11th meeting of the Conference of the Parties to the Vienna Convention and the 29th Meeting of the Parties to the Montreal Protocol held in Montreal from 20 to 24 November. The parties also celebrated the 30th anniversary of the ozone-saving treaty during the meeting with high-level participants, including the former Prime Minister of Canada, Brian Mulroney. The parties requested the Technology and Economic Assessment Panel of the Montreal Protocol (TEAP) to assess the technology options for enhancing energy efficiency of appliances and equipment in the refrigeration and air-conditioning sectors while phasing down HFCs under the Kigali Amendment. The panel will also assess, among other issues, the challenges for the uptake of those technologies, their long-term sustainable performance and viability, their environmental benefits, and related costs. The parties also agreed to hold a workshop on opportunities for enhancing energy efficiency while phasing down HFCs during their 40th Meeting of the Open-ended Working Group in July 2018. The parties also requested for regular updates on the safety standards relevant to the use of flammable low-global warming potential alternatives to HFCs, in consultation with relevant standardization organizations. This is crucial for ensuring the safe market introduction, manufacturing, operation, maintenance and handling of low-global-warming potential refrigerants that are used in many sectors. The meeting also urged parties that have not yet ratified the Kigali Amendment to consider doing so in order to achieve the goals of the Amendment. The Amendment, which has so far been ratified by 22 parties, is set to enter into force on 1 January 2019, requiring the nations of the world to gradually phase down HFCs by more than 80 per cent over the next 30 years and replace them with more planet-friendly alternatives. Phasing down HFCs under the Protocol is expected to avoid up to 0.5°C of global warming by the end of the century, while continuing to protect the ozone layer. "It is through the widest ratification of the Kigali Amendment that we will deliver on its promise of protecting our planet for future generations,” said Tina Birmpili, head of the Ozone Secretariat. The parties also agreed on the need for increased support for research and systematic observations of the ozone layer, as it is through the observations that scientists can monitor the recovery of the ozone layer and the interaction between ozone and climate. The meeting also included a round table discussion by environment ministers from around the world moderated by UN Environment Champion of the Earth for 2016, Leyla Acaroglu, which focused on future opportunities and priorities under the Montreal Protocol. The panelists were Khachik Hakobyan (Armenia), Catherine McKenna (Canada), Zoila González de Gutiérrez (Dominican Republic), C.K. Mishra (India), Meelis Münt (Estonia), Sydney Alexander Samuels Milson (Guatemala), Abdullah Ziyad (Maldives), Vincent Biruta (Rwanda) and Erik Solheim (UN Environment). In addition, a science panel discussion took place on the theme “The scientific foundation of the Montreal Protocol: past, present, and future.” Top scientists from various countries discussed the effect of the changing atmospheric composition on the ozone layer; ozone depletion and climate change; and observations and monitoring needs for ozone layer protection and recovery. The meeting also included an award ceremony to honour individuals, groups, organizations and parties that have demonstrated extraordinary commitment and contribution to the progress and achievements of the Montreal Protocol, especially in the last 10 years. The awardees received trophies and artworks custom-made by various talented artists for the eight categories of the awards – political leadership, policy and implementation leadership, scientific leadership, technical leadership, exemplary project, partnership, youth creativity, and best media coverage. 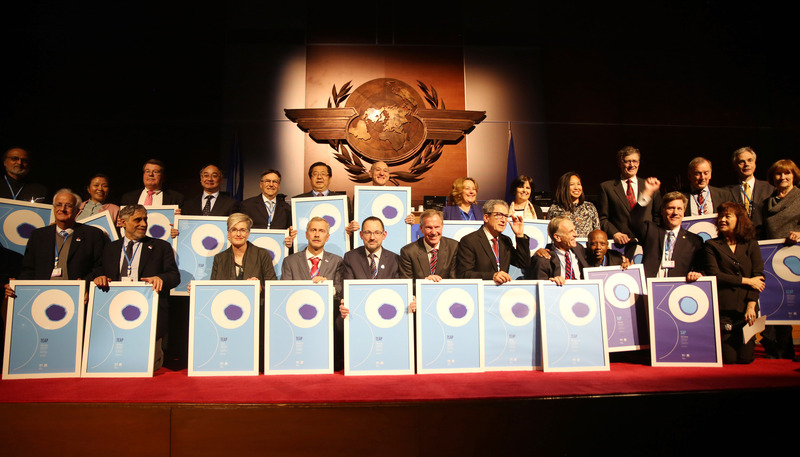 All the 197 parties to the Montreal Protocol also received specially designed certificates in recognition of their tireless efforts, commitment, passion, and dedication to the protection of the ozone layer over the past 30 years.